Mixed berry pie filling…so this winter we should be enjoying and sharing some pies! 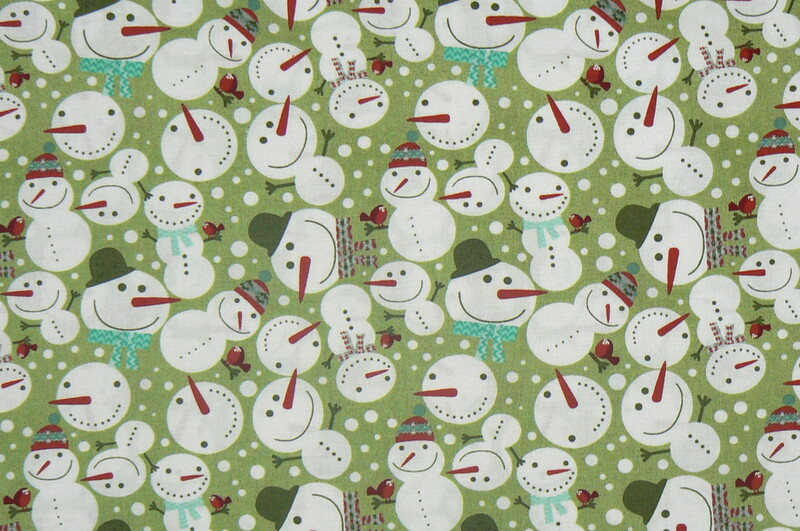 I’m looking forward to some jammy pants or lounge pants for my boys out of these snowmen. It is hard to tell but there are sweet little red birds on this print too! We are also planning some other girl things!! 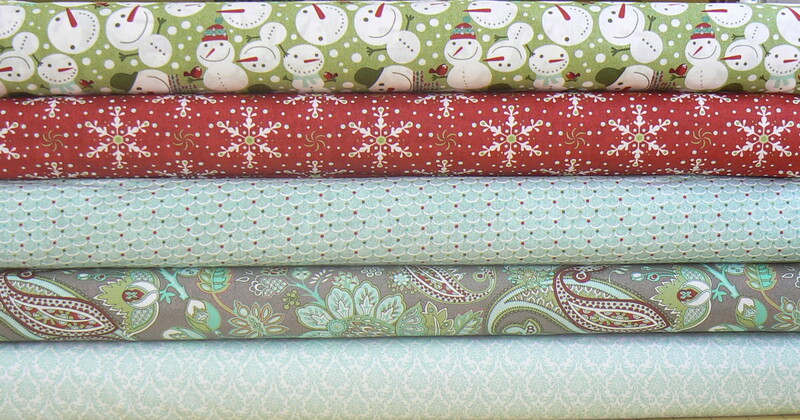 Might seem a little early to be looking at winter fabrics, but I’ve got to think ahead! 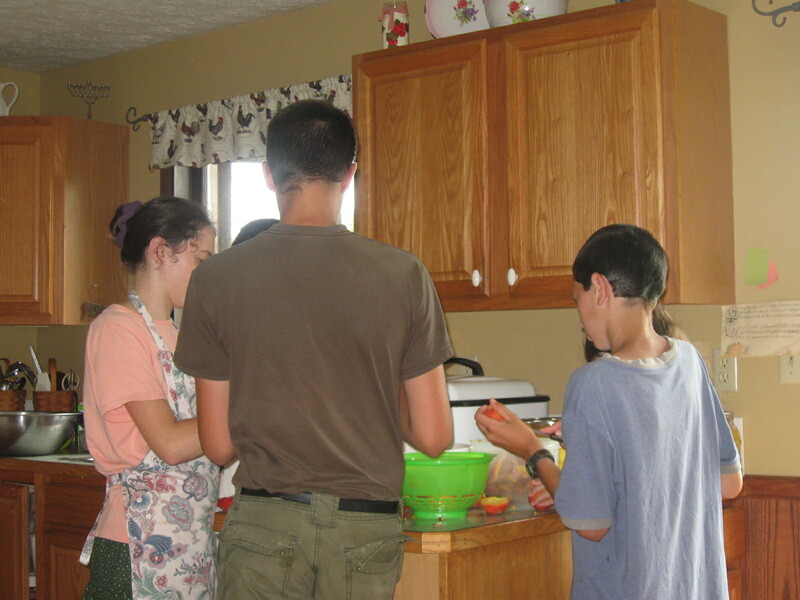 Here my daughter is blanching corn for her brothers…she has to do de-hair quality control on her smaller brothers who do shucking duty.. 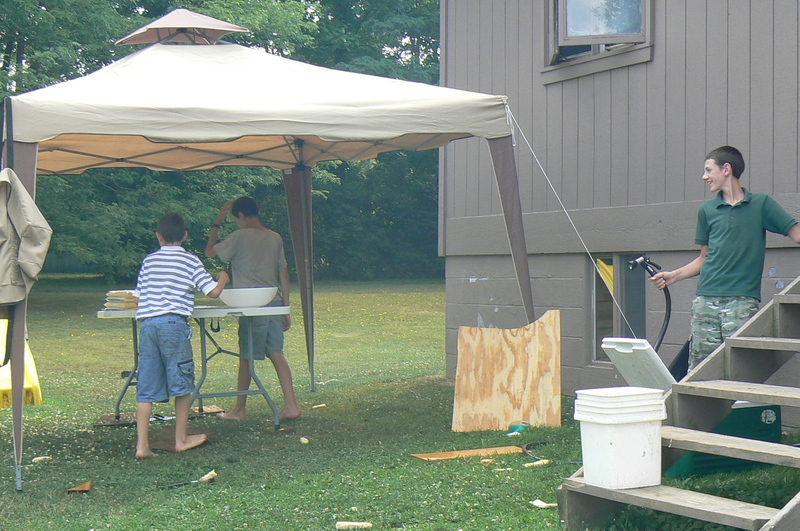 The older boys set up outside under a tent and cut the corn off the cobs after it cools in the cooler full of water…they have quite a system going, would you believe I just popped up now and then to make sure everyone was safe and toward the end I enjoyed shucking with the little ones… Just two or so weeks ago we did tomatoes…we do them as they come and we had a bad start this year. My son planted a different variety for an experiment. They are called determinates. They are in bush form and they don’t need to be staked up. We got a variety for paste. The first part of the crop would rot at the end. After some research he found that there is something called blossom end rot. He found that the plants needed calcium. 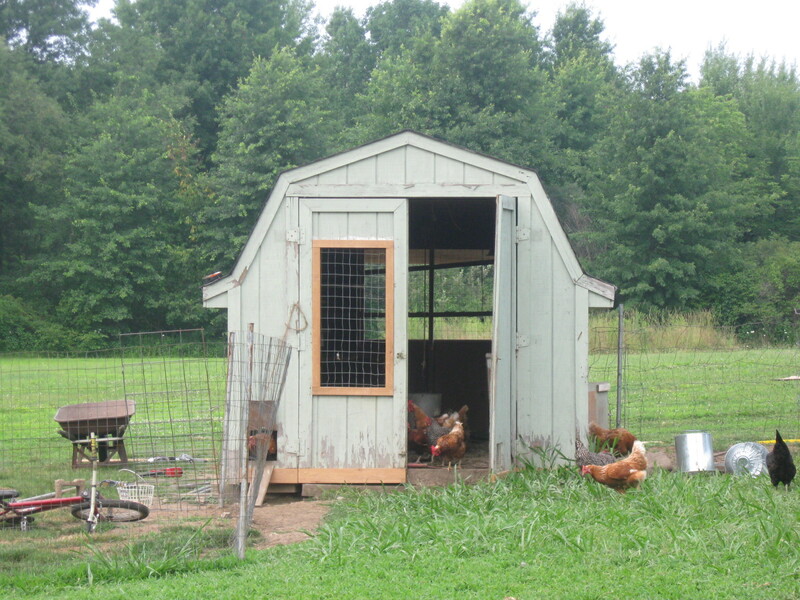 We have good soil because we sweeten it with our composted goat manure. So he decided to get Epsom salts, which have magnesium in them. He put this around the tomatoes to help them absorb the calcium that was in the soil! And they began to do better! We will get more tomatoes in a week or so. And should be able to get a better yield. 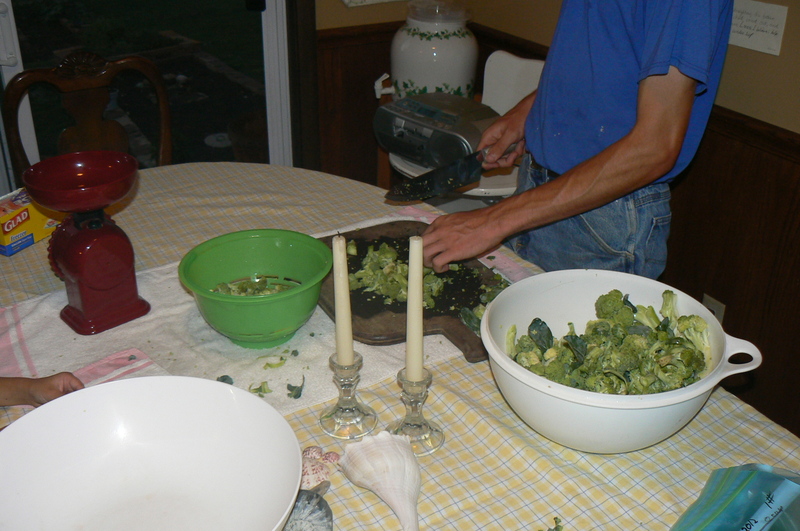 Here my oldest is putting up his broccoli harvest, the same night we were doing tomatoes. He froze it in one l pound increments for me! The baby (my baby) 🙂 is helping with dishes in preparation to do the tomatoes. We chose to do paste, or juice with this batch. We use it for tomato soup and in other soups. Here is some of our yield on a shelf that my older boys made for me last year. The difficulty we run into with a house that has no basement is where to put these cans??? This is just a portion of this years work. I think it’s kind of pretty! Just today my 5th born helped me to do green beans. We’ve also done some jams and pie fillings and peaches. But now that I’m writing this I’m realizing I need to think about some apple sauce! Just a word for moms, do let the children help. Do let them know how vital they are to your family! It is a very good thing!! So, I am thankful in August before many people may be thinking about harvest! 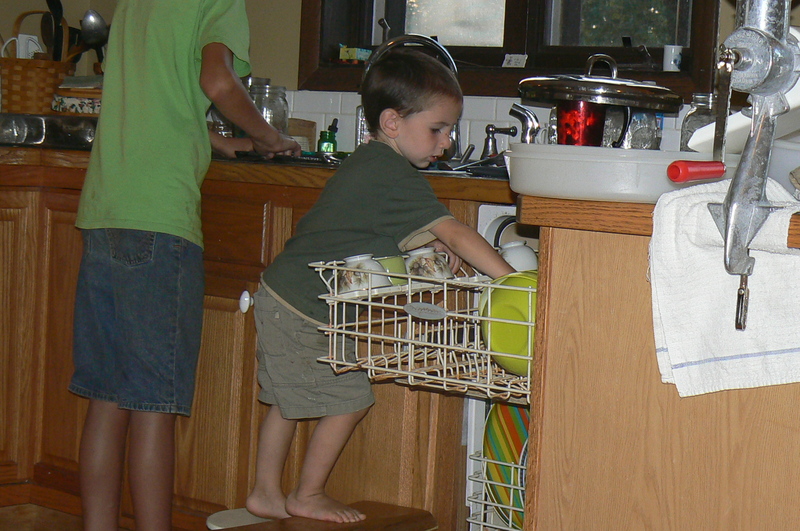 And I am thankful that the children are so helpful…and right now there is a little one upstairs who needs mama to talk to him! 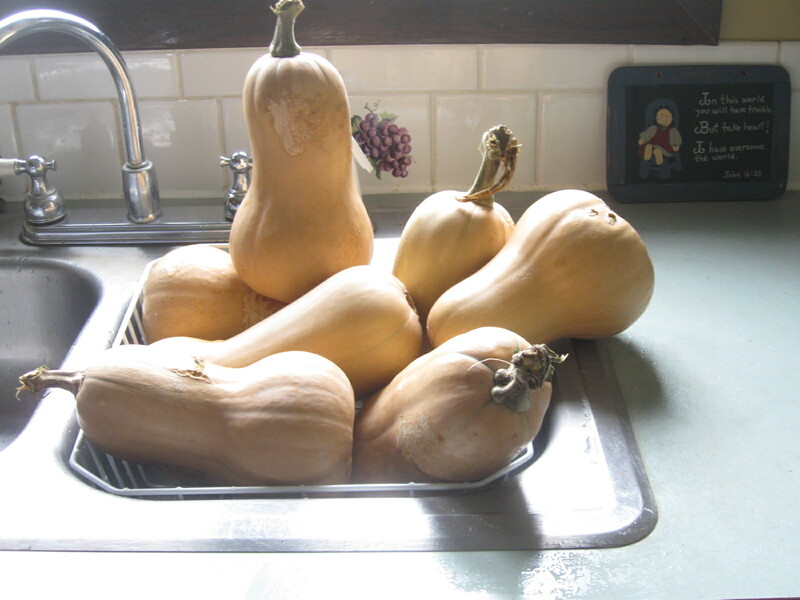 Our friend who has a farm, and a HUGE garden, gave us this beautiful butternut squash! Then we steamed them till soft. We put them in the fridge overnight because we ran out of time. This morning I peeled the peels off and mashed them a little and put them in the oven to heat, so the canner wouldn’t take so long to heat up. Then I mashed them like potatoes with out any thing extra. The above two steps could have been eliminated if you have a Victorio food strainer with a bigger screen. 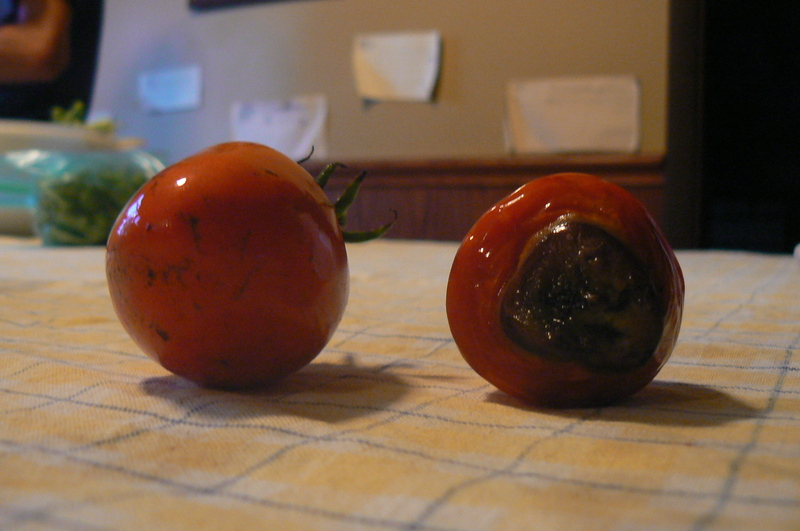 We just have a tomato screen so I did the peeling and mashing method. 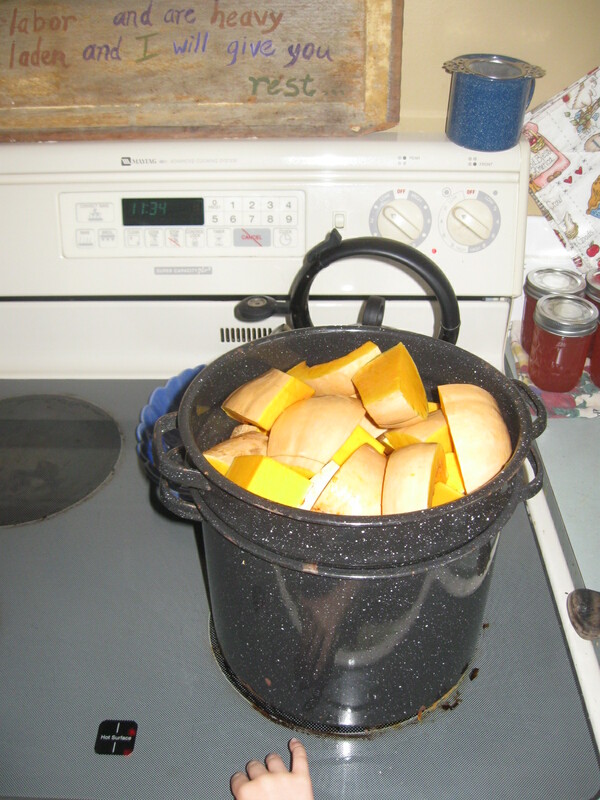 Put the mashed squash into quart jars and apply the lids. 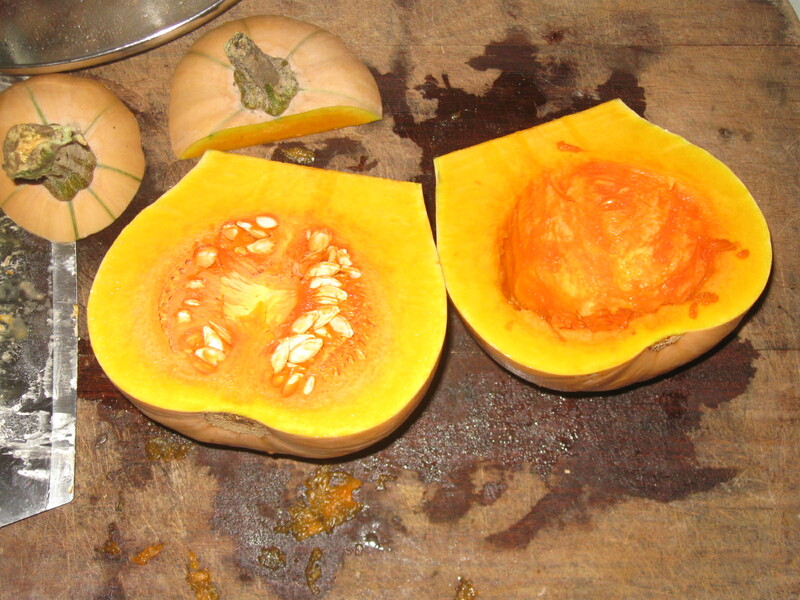 One thing I was very careful about was getting the pumpkin packed as densely as possible. We left 1″ head space. We processed them at 10 pounds pressure in the pressure cooker for 100 minutes! We yielded 7 quarts and can use it for pumpkin pie, sweet potato pie, or muffins and cookies! Looks like pumpkin! Tastes sweeter than pumpkin! The darker spots are from my heating them up in the oven. Thankfully, our family is not too picky about a lump or a darker spot. They just enjoy the end product!! 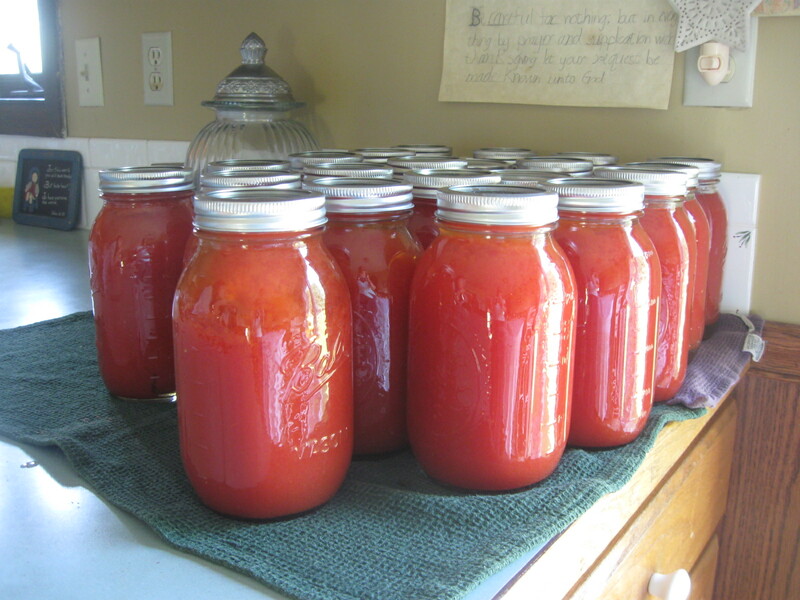 Thank you Mrs. S. for all your help with canning questions and for the lovely butternut squash! 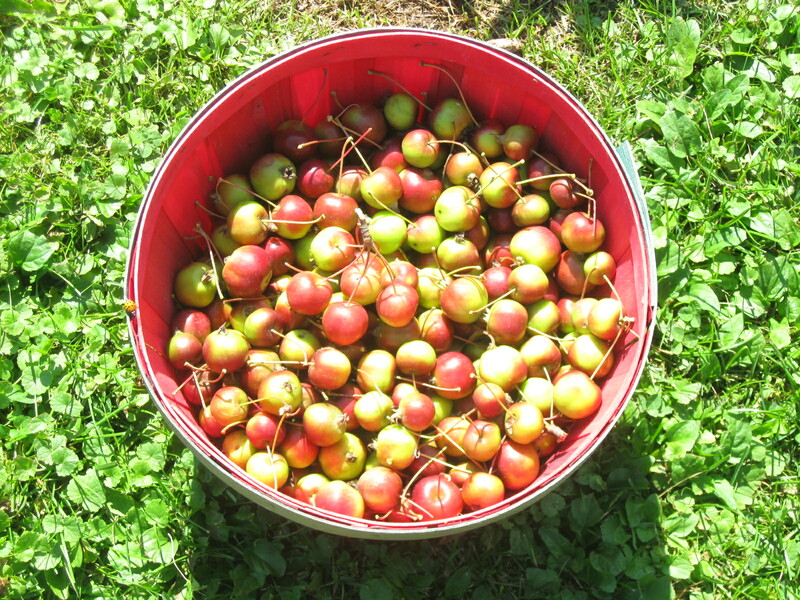 This week we harvested our crab apples. 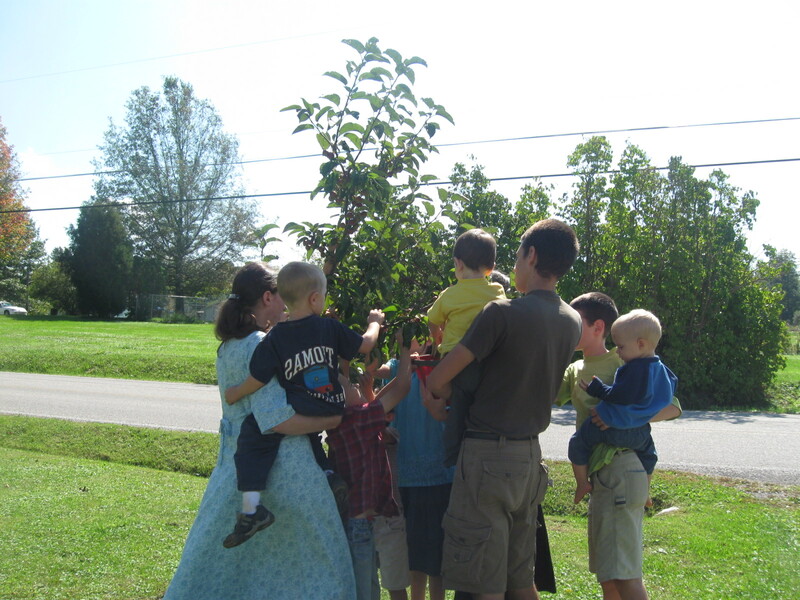 We found some trees on our property and replanted them in the front yard. I thought they were apples because of the blossoms. 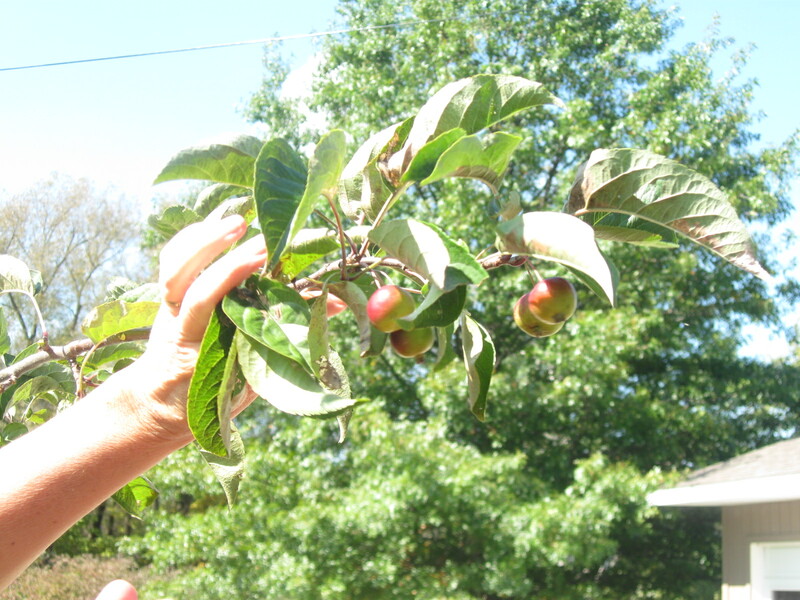 As they grew, they turned out to be crab apples. 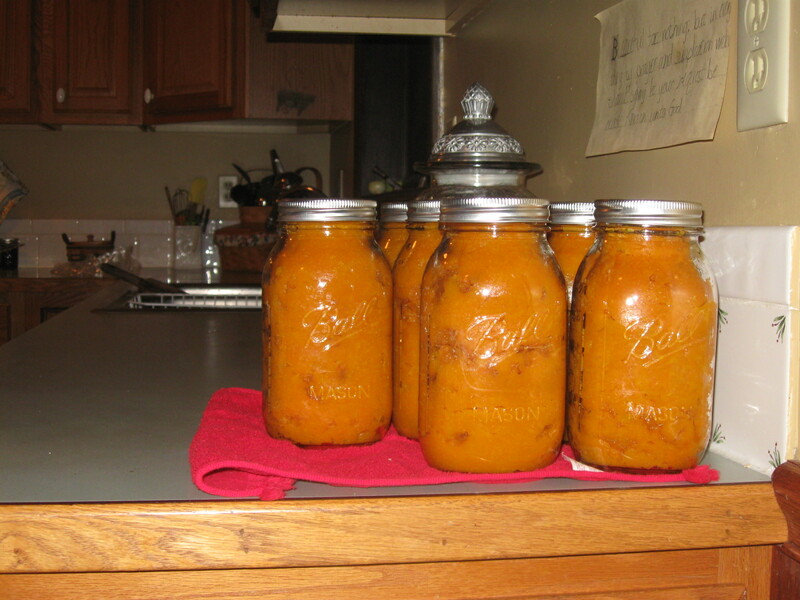 I had visions of apple sauce and apple butter for the winter. Alas, crab apples. Well what can you do with crab apples? We decided to “try” crab apple jelly. We had fun harvesting…every body helped and even a couple of little boys we were watching for the day. 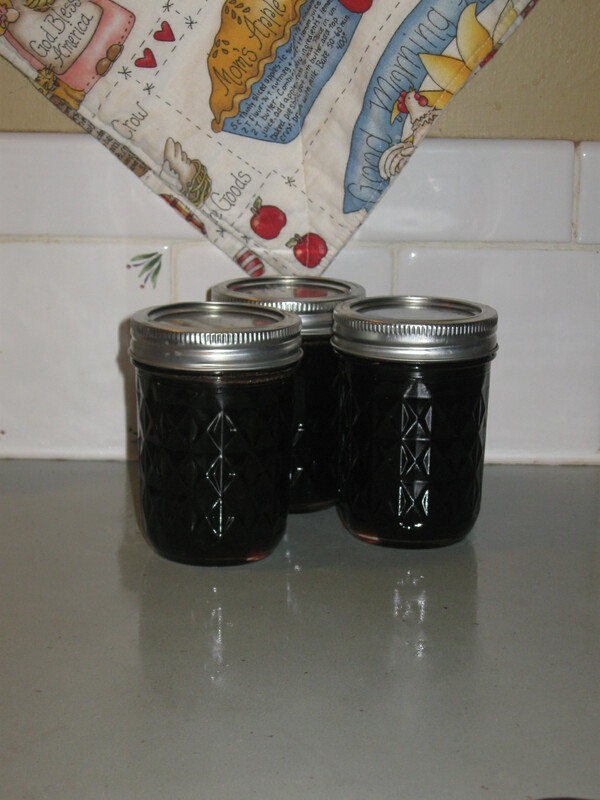 I have never made jelly before, because jam is easier… But as a little girl I always thought apple jelly was yummy so we gave it a try. We stemmed and deflowered the apples, then cut them in half. Then put them in a pan and covered them with water. Then brought to a boil and simmered for about 1/2 hour. Then got some unbleached muslin from the sewing room, lined a strainer with it and put the strainer in a pan to catch the juice and poured the hot apples into the strainer lined with muslin. This gives you a nice clear apple juice in the pan. Unfortunately, I was in a hurry and wanted to HELP to juice out and so brought the muslin out of the strainer and squeezed my apples to extract some more juice. That is a no no. It makes cloudy juice. Not gorgeous, clear, gem like jelly. Live and learn. 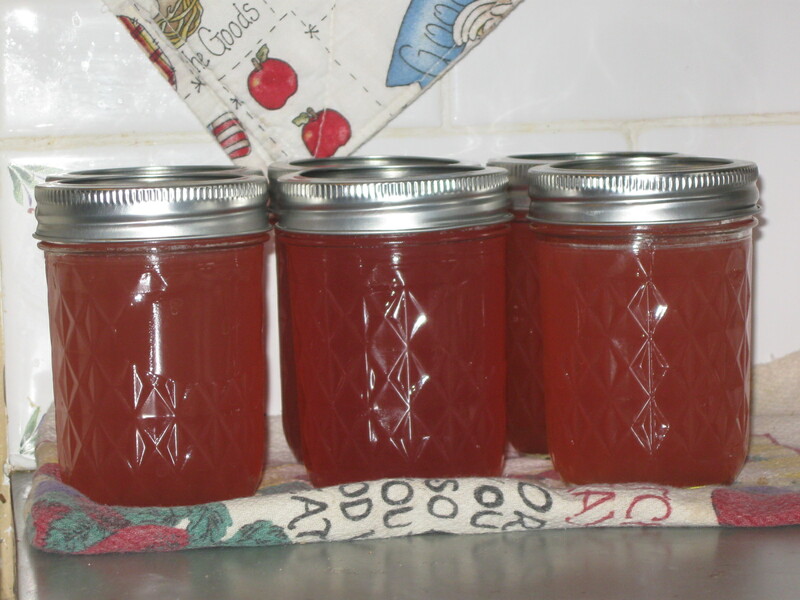 We were told by a friend that apple jelly if cooked long enough doesn’t need pectin. So we just measured our juice, we only got 5 cups of juice. We don’t like to add a lot of sugar, the recipe called for 4 cups of sugar. We added 3. Then began cooking the sugar and juice mixture. Again, I became impatient..I had two sewing orders, one quite large that needed shipping on that day so I didn’t wait for it to cook long enough. 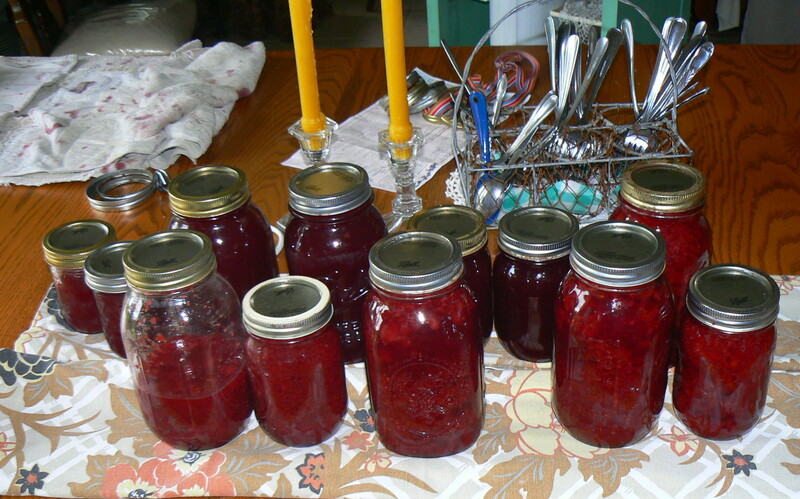 I whipped out some Certo Liquid pectin, to help the jelly along and put the hot jelly into jars. We just inverted the jars for a few seconds and then turned them upright and they sealed beautifully. I got 6 pretty little jars of crab apple jelly. A little cloudy but a pretty color! B. Open the jars and cook down the jelly longer which is what they did in the old days, and have maybe 5 beautiful jars of crab apple jelly. I was shooting for crab apple jelly so, I think I’ll do plan B. It does seem a shame not to just pick these gifts off the tree and eat them. We did a little of that. But with winter coming jelly will be nice to have around. Today cooked the jelly again and now it is set!!! It turned out a deeper color, very red. Hard to believe it is the same jelly! But it only yielded half of what I started with, and it is very sweet! Next time I’ll be more patient. Less multi- tasking. 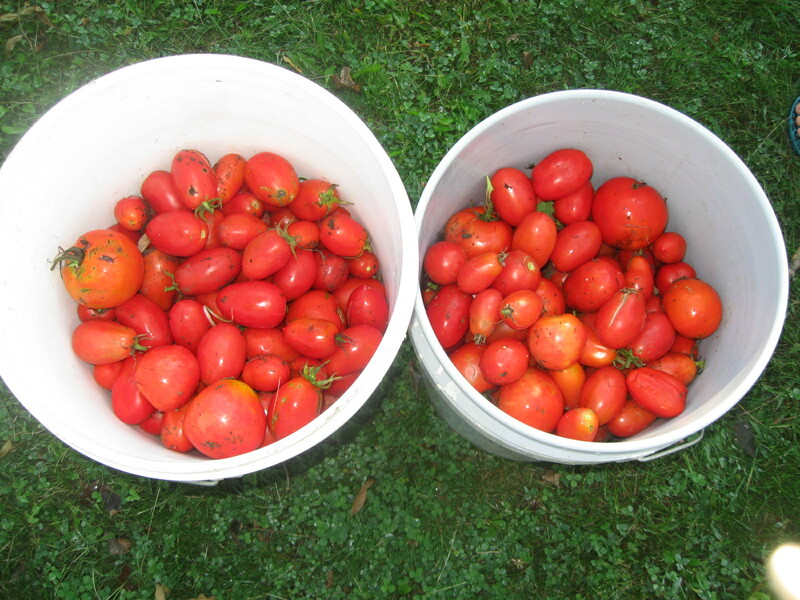 This week we put up tomato juice to use making creamy tomato soup and to add to our spaghetti, chili, vegetable soup, etc..
We grow Roma tomatoes for their quality meaty fruit, this year my son planted 80 plants! He has a dream to be an organic gardener. We picked early in the morning..
Roma’s are an egg or oval shaped meaty tomato, we had some volunteer tomatoes come up this year also. We wash and top the tomatoes, put them in a stainless steel stock pot with about 2 cups of water and cook on high until the skin splits. Then we run them through the Victorio strainer, a wonderful tool! 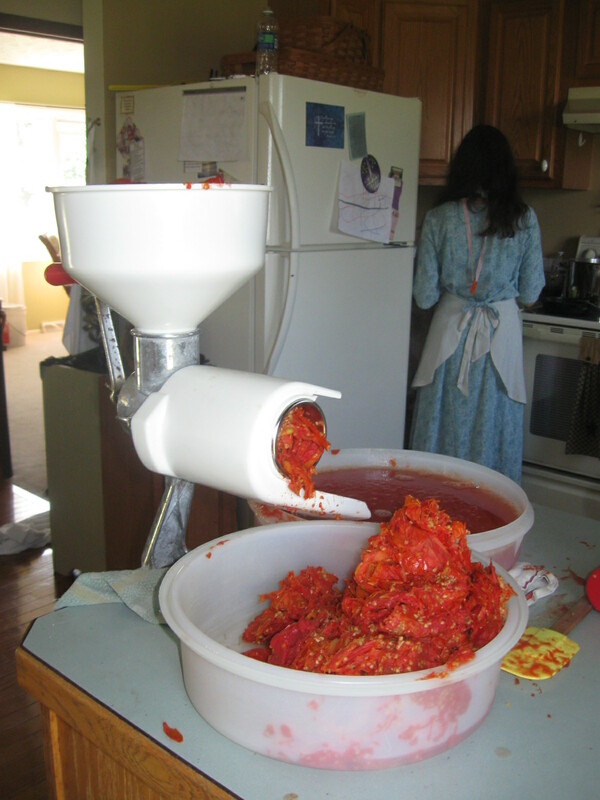 The tomatoes go in the hopper and you turn the crank, there is an auger with a metal sieve/screen attached, the juice and beautiful pulp is strained through the screen and the auger pushes the skin and seeds out the end. 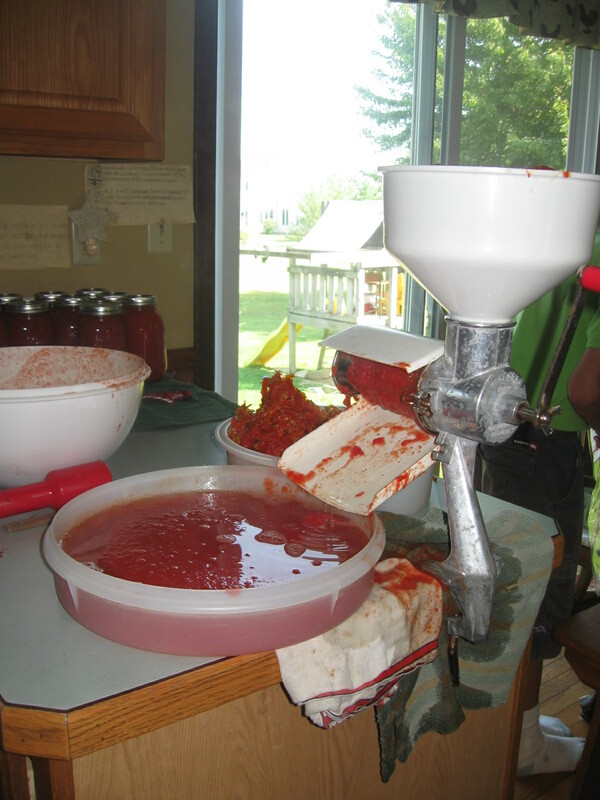 We then pour the juice and pulp into a bigger bowl to mix together, because when pouring the tomatoes into the hopper the hot juice and water comes out first with out cranking and the pulp has to be cranked out. So the first part is mostly liquid and mixing the pulp in gives even consistency. Beautiful, fresh and RED isn’t it? After mixing the pulp and juice we pour hot into clean jars and process in water bath for 15 minutes. 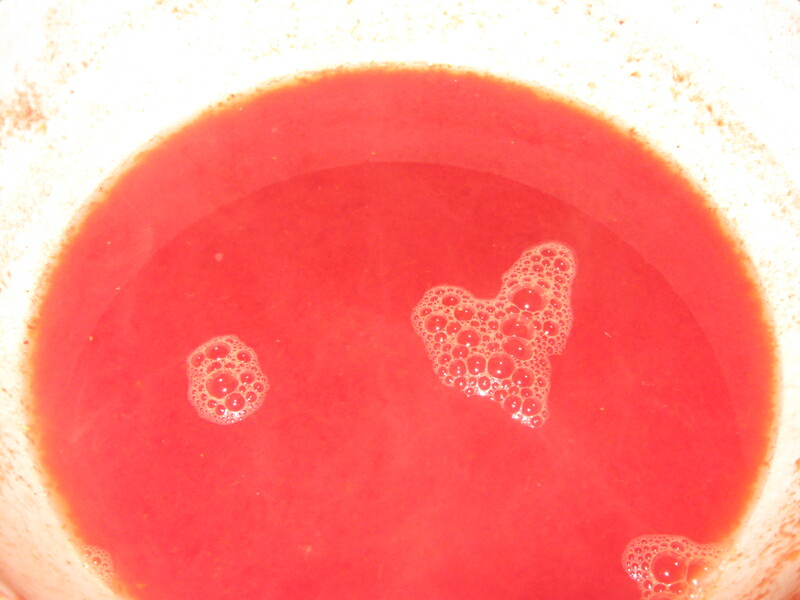 It will be delightful to have hot tomato soup this winter! add remaining milk and heat through, then add tomato juice and spices, stir constantly to thicken, then simmer 30 minutes to blend flavors. Remove bay leaf and serve hot! Yummy! This year we got 5 bushel of peaches from a farmer in our area. He called Thursday evening and wanted us to pick them up. He had traveled up from Virginia with them and was worried they would spoil from the heat. It was hot last week! My husband picked them up and the farmer told him you better put these up right away. And that is what we did. 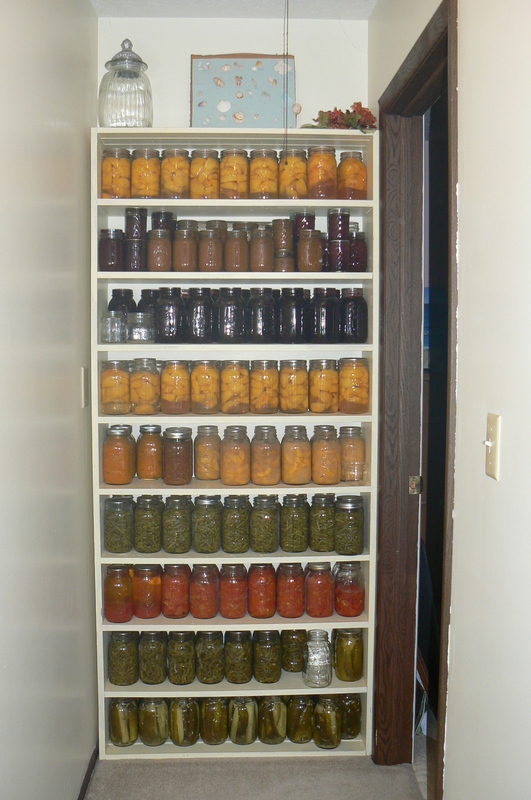 On Thursday night the girls and I put up 21 quarts, 16 of fruit cocktail and the rest peach halves. 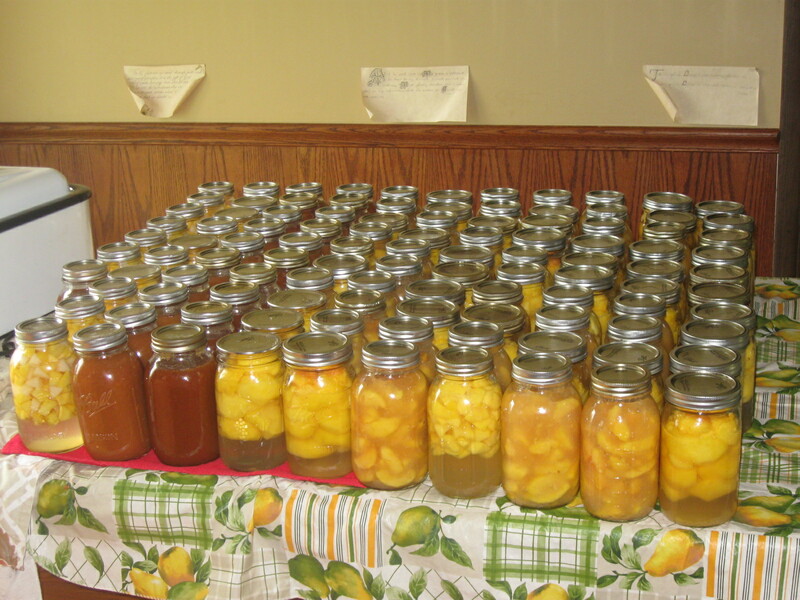 Up on Friday and back at it we finished Friday night with 107 quarts of peach products! 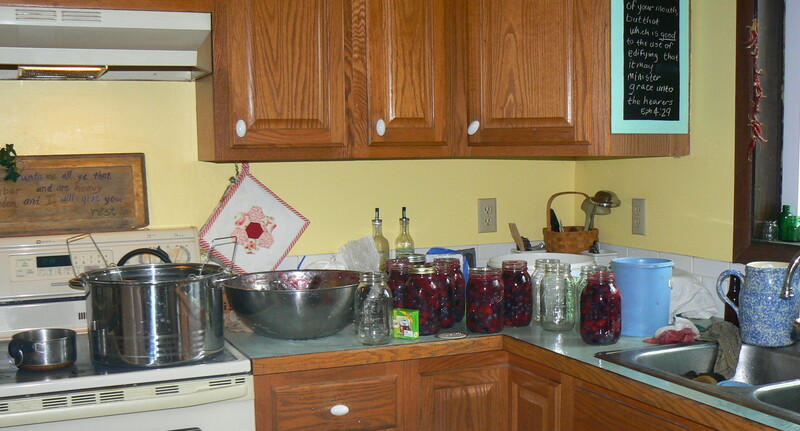 That is the most we have ever done in one canning. There was the fruit cocktail, peach halves, a couple peach chunks, peach pie filling, peach jam, and peach pineapple jam. Whew!! It was a long one! But fun and rewarding! 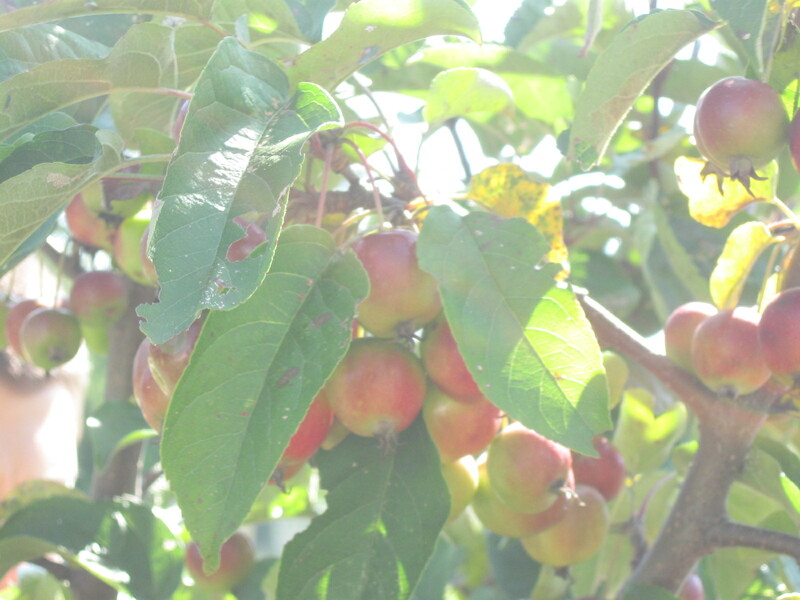 Our friend told us about peeling the peaches and slow cooking the peels in a roaster or crock pot, for pressing later in a food mill to make jams. It is a wonderful way to get the most out of your fruit! 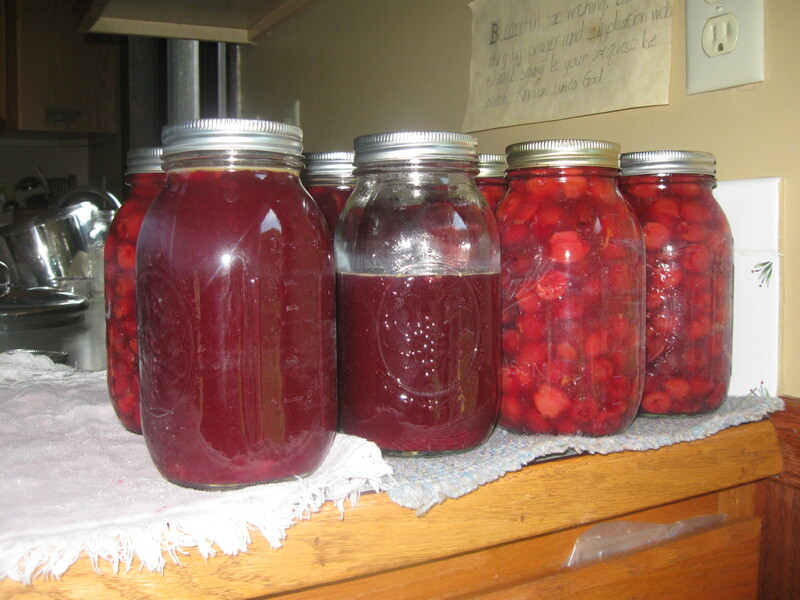 The fruit of our labor… Only 1 in 107 jars didn’t seal. We took care of that at our Sunday snack! Today we have to finish up the jam. We refrigerated a big bunch of pulp because we ran out of sugar. Then we followed Pomona’s pectin double recipe instructions. Pomona’s lets you decide the sugar ratio. We used the lowest, haven’t tasted it yet, but last years was yummy. Today was a working day, the last few days it was up near 100 degrees and humid and we don’t have air. We were a little slow on those days. Not to mention the children were falling sick all week, one on Monday, one on Tuesday, one on Thursday, and one on Friday. No one today yet. They had fevers and terrible headaches. The older ones suffered quietly, but my seven year old has zero pain tolerance so, that is trying on the nerves! I think that is why today we got so much work done, we were able to move a little faster with the heat slacking off. 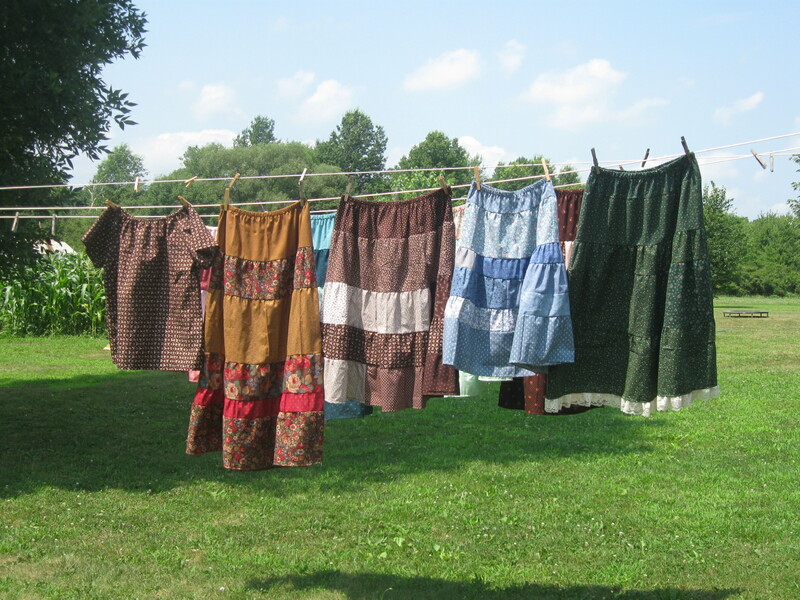 The girl’s and I finished some scrappy tiered skirts. A dear friend who is my son’s piano teacher, and taught the girl’s earlier, is an avid quilter. I don’t know if that is the best description. She is an awesome quilter. When my son came home from piano Thursday night he brought two white kitchen trash bags of scraps leftover from her quilts! We had so much fun looking through them. When you sew, and people know it, sometimes they will send fabric your way. Sometimes you are thankful, but you can’t really use it. Other times you are thankful and you get excited! This was an excitement case! Being an excellent quilter isn’t all she is, she has always amazed me with her color coordinating. 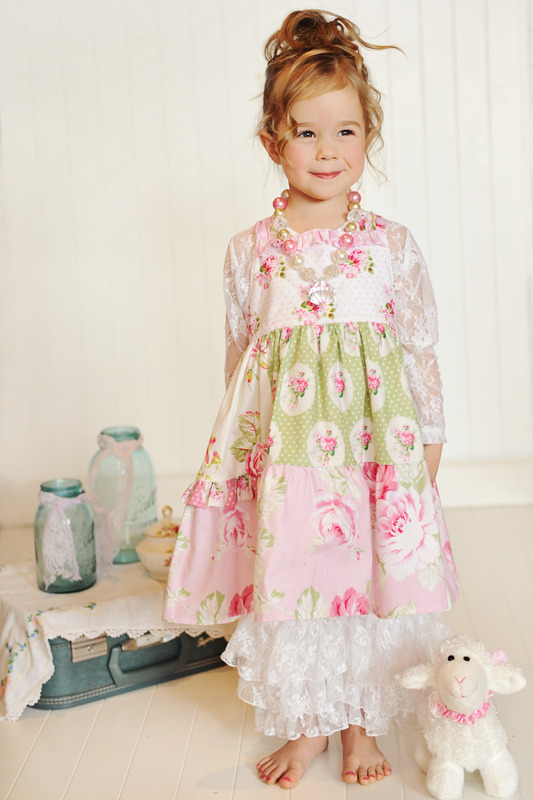 So, this fabric was perfect for our tiered skirts, and we were in need of some! I also got to make a blouse for myself, two or three years ago, she sent home fabric and I made a blouse then, and the girls got dresses made up! Wow, thank you Ruth! 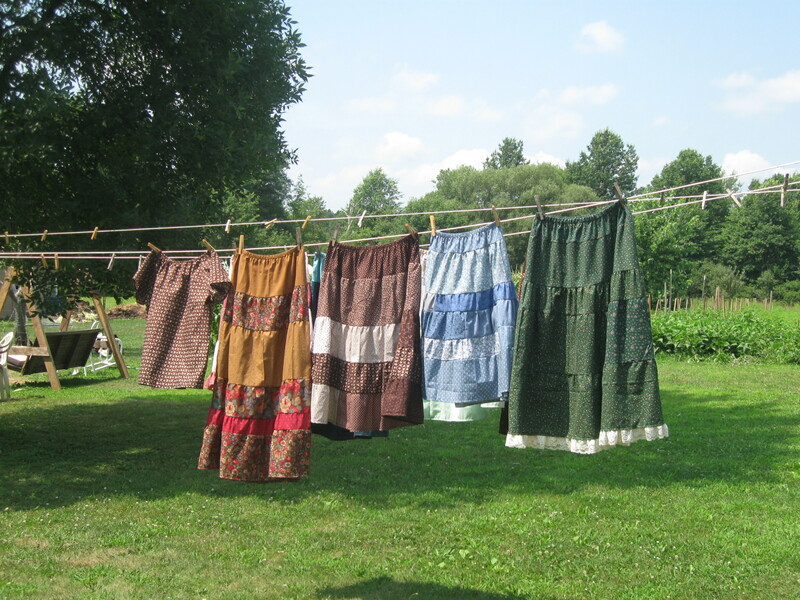 I’m working on a tutorial on making these skirts which I hope will be helpful. I’ll get it posted next week hopefully. Then, today a neighbor who we met at our local farmer’s market stopped by and asked if we could use some cucumbers, well, ours just happen to not be doing well this year so our answer was yes! I immediately wanted to make pickles. 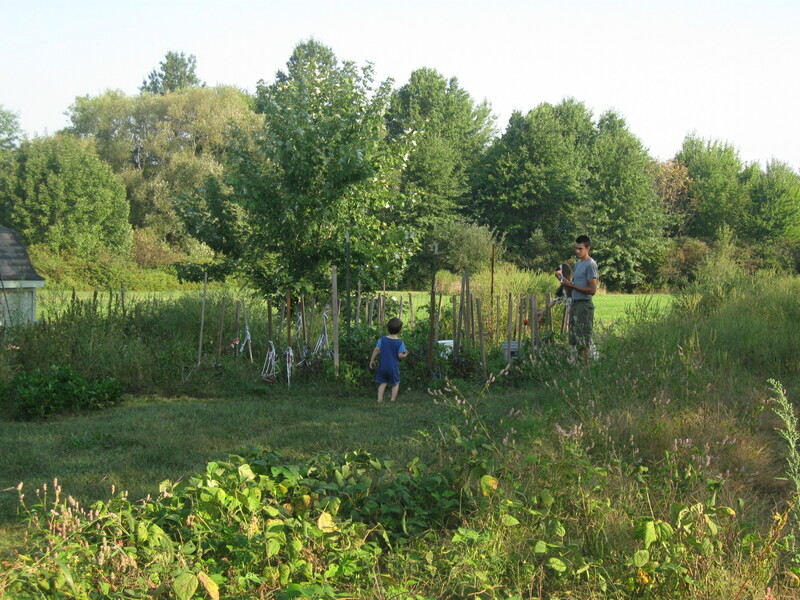 We also had picked up our annual 30# of cherries at a local farm and those needed put up. I forgot all about them, sitting there sewing away this morning until the neighbor came with the cucumbers! Oh my! We have to do cherries and pickles! Well, we got them done! Praise the Lord! Just have to give credit where credit is due! 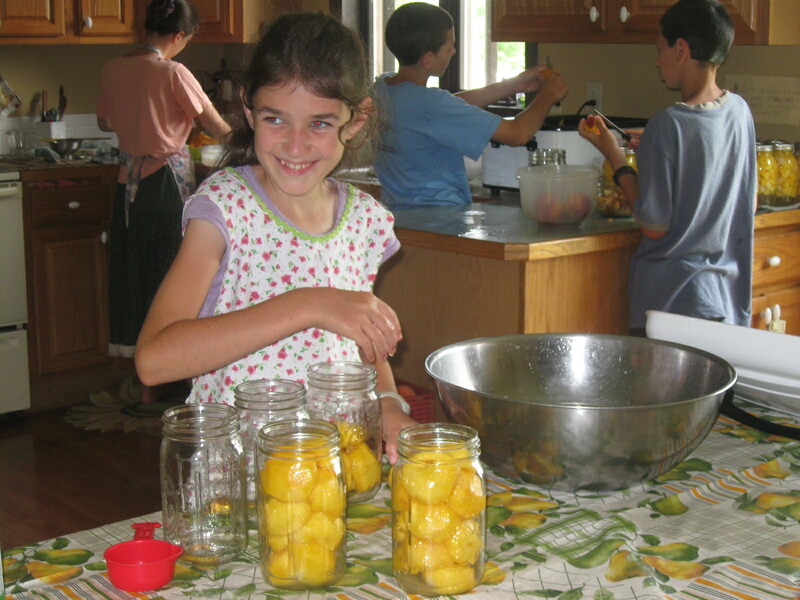 That canning looked daunting at first, but the girl’s were up for it and my husband and the boys were working outside on the chicken coop. I don’t know why but I just love to get stuff done around here and it seems to give me more determination when my husband is sprucing up outside, even if I am tired. 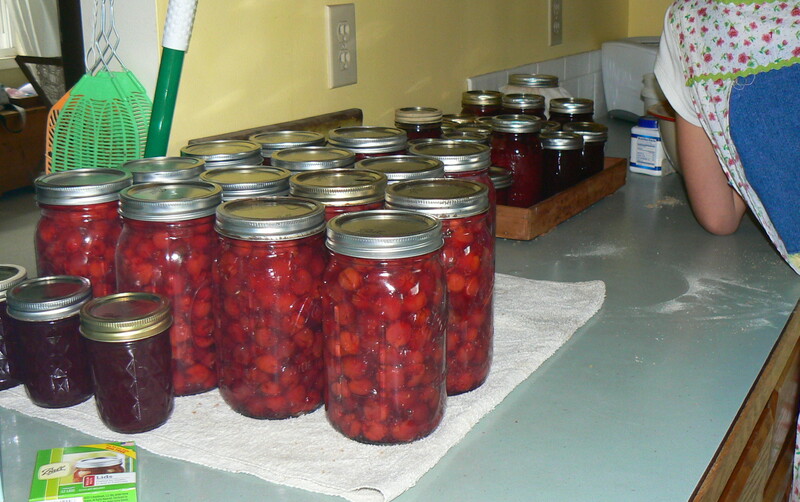 So, we froze some cherries, and made pie filling with some cherries, and we made some jam/jelly with the juice and some pulverized cherries. I want to let you all know about Pomona’s Pectin it takes less sugar than Sure jel, or Ball Brand, I have always been mortified at all the sugar it takes to make jam, and this year a friend told us about Pomona’s, we haven’t seen the end result yet, our jam will sit for the next 24 hours, but even when we used the other brands we had some that didn’t set well. It is just so good to know I’m not pumping the children with sugar!! For a 4 quart preparation of berries or juice you only need to use 3/4 cup of sugar. You can add more if desired but it is not needed. Ball is 6 or 7 cups and Sure jell is a little less. And you have to stick with their recipe or it won’t jell properly. We are thankful for our friend letting us know! The pickles are still in the water bath. 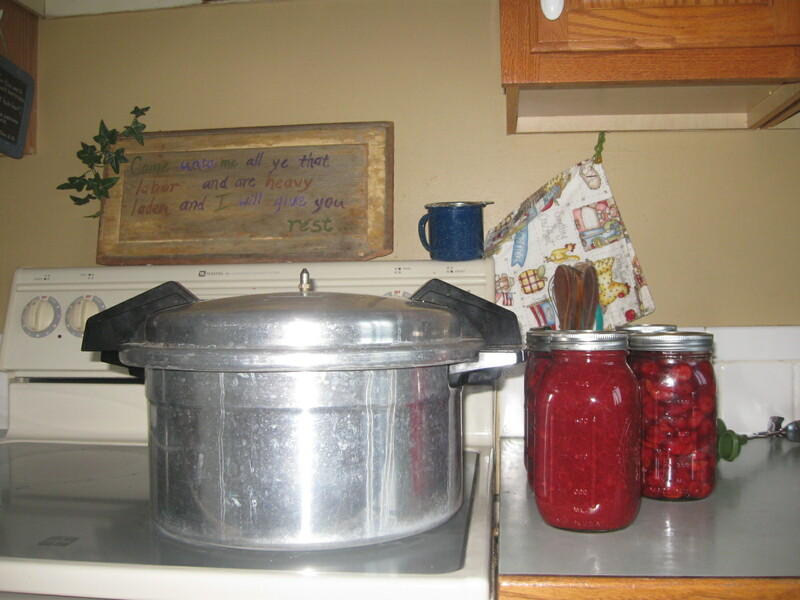 Then one more load of cherry goods:-) Olivia is baby sitting the canner while I am writing this! 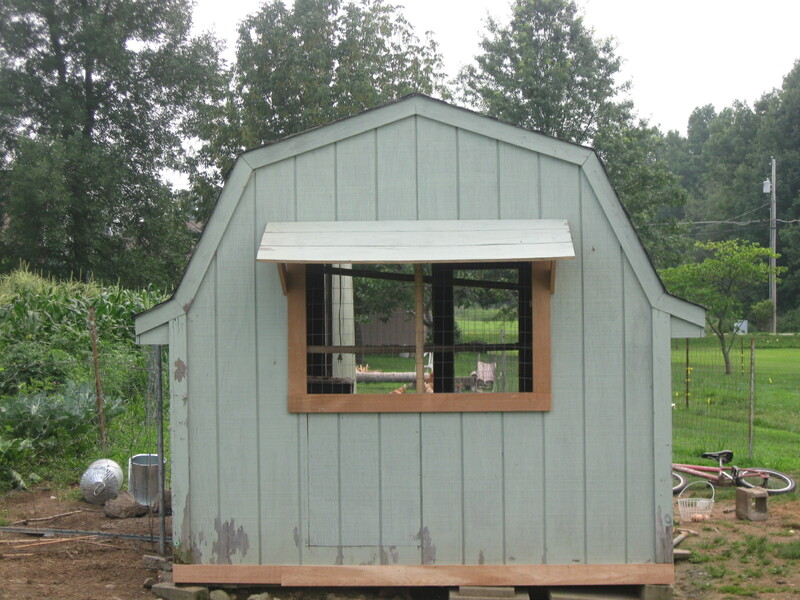 My husband has one care giving client in the evening on Saturday’s so, after he went to work the boys finished up the chicken coop, I mention this because I remember when all the children were young and it was very hard to get things done around the house because of the time taking care of the little ones. It is all worth it and I wouldn’t trade any of the years training and bringing up my children, but this fruit today really blessed me. We’re doing the last load of cherry pie filling and I hear a saw running….I ask the girls,” your dad is gone who is running a saw?” They said their brother, who works with him and is 21. That just flooded me with thankfulness, Wow, my baby is a man, and he is finishing the job his dad started! And my 15, 14, and 12 year old sons were helping too! I don’t know what to say, it is such a blessing to have them just work with us! 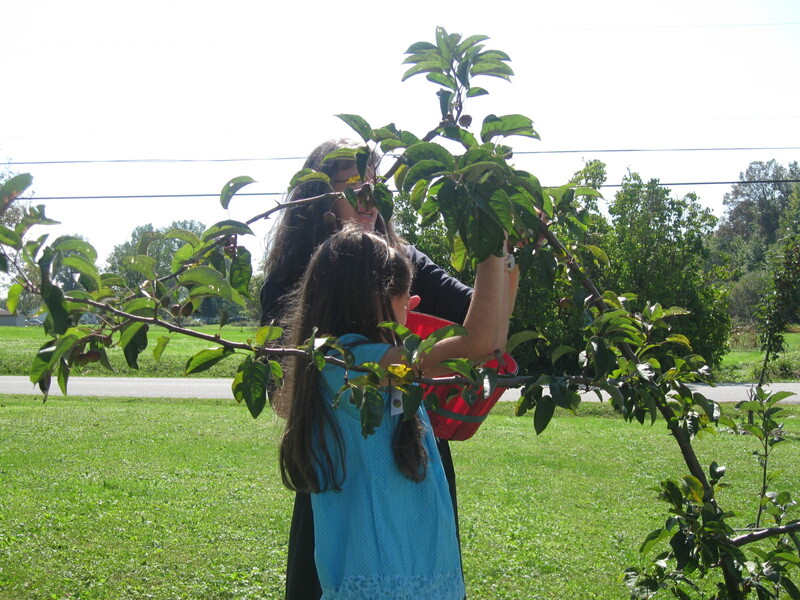 We are harvesting fruit! When they are small let them help you with everything, bring them into your life. When they are older they will bless you! Wow! Bless the Lord, O my soul and forget not all His benefits… That is from Psalm 103 it is rich. Earlier this week when it was too hot for much I was comforted by verse 14…For He knoweth our frame; he remembereth that we are dust. I love that! He understands. He knows. He is O.K. if we have a low or slow day. That is freeing for a work-a-holic!! I’m not glad I’m driven, but I’m glad that He is showing me He is not driving me! Thank you Lord! Tomorrow is the day of rest! Yea! Thank you Lord!